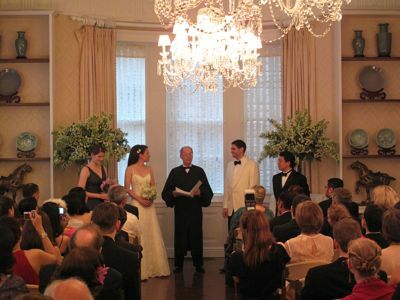 The actual ceremony and vows were done in a large room with sparkling crystal chandeliers and magnificent views onto Park Avenue. Seats for 120 made this a snug but intimate set-up. Marketman earlier in the day making sure the two large arrangements of white hydrangeas (the long type, not the usual ones you see on this site) were balanced and photogenic. Arranged in huge fluted silver vases, acquired at auction, these were simple yet festive, and flanked the minister and couple as they took their vows. 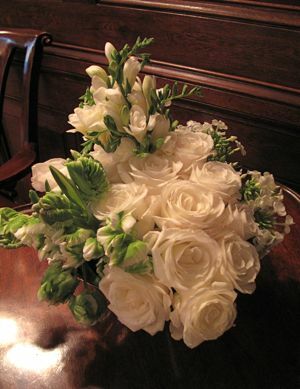 Small tight arrangements in square silver “bowls” with roses, freesias, tulips, etc. were placed on side tables, cocktail tables, etc. 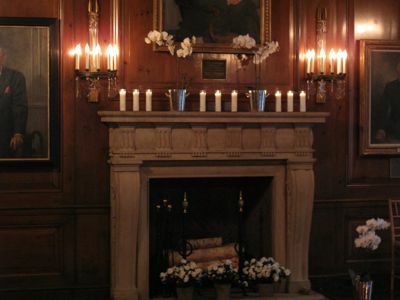 The mantels of all the fireplaces were also decorated with small arrangements, and several candles, as were the window sills. 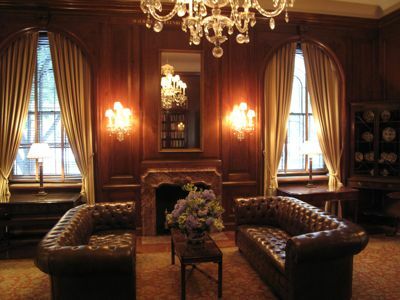 This sitting area with enormous leather couches had an arrangement of white and blue hydrangeas. 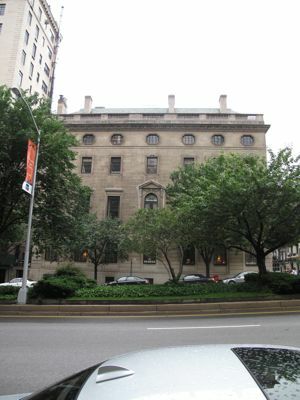 …to music by violinists from the Julliard school played in the background. 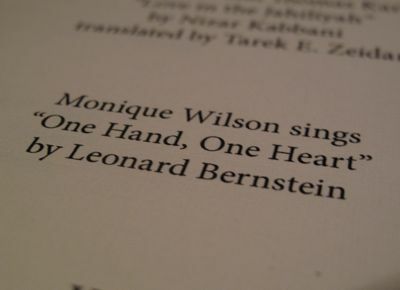 …which mentions a special rendition of a Leonard Bernstein song by Monique Wilson, a member of our extended family of cousins, who flew in from London to attend the wedding. 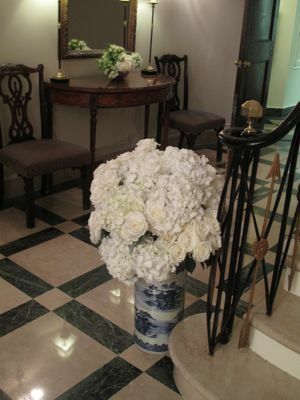 At the base of the marble staircase is a large arrangement of dozens and dozens of huge white roses with white hydrangeas, all set in a blue and white ceramic umbrella stand, that sister crafted in the wee hours of the morning. 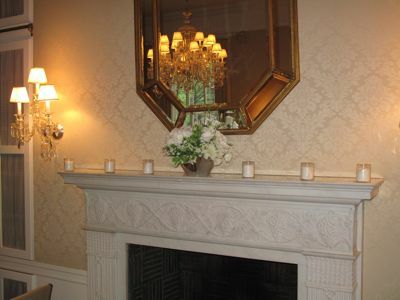 …and enormous limestone fireplaces were decked with short and tall candles, white butterfly orchids and potted white azaleas. 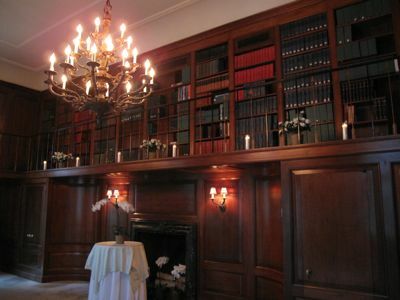 One of two bars set up in the green ballroom and the smaller library. This one had a guest bartender serving up the reception’s signature drink, a sazerac, a cocktail from New Orleans that has rye whisky, bitters and absinthe; the latter now legal again in the United States. There was a whole process to the mixing of the drink, and it got to you literally “smoking”… serious alcoholic content, and though I had a sip or two, not the best thing to pair with flu medication! For the younger crowd, it flew off the bar like hotcakes! 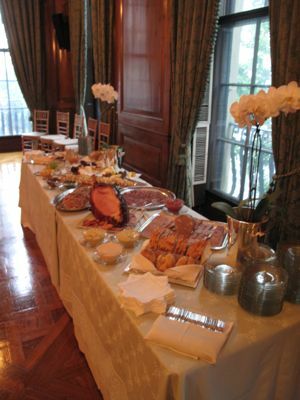 Hors d’oeuvres and a more substantial buffet was catered by Daniel Boulud’s events arm called Feasts & Fetes, whose chefs and waiters did a superb job throughout the evening. As for details, details, I was stunned that sister provided her own linens, and those in the room with green drapes included light green tablecloths and those in library tan colored tablecloths and napkins, all from Frette. She even brought a housekeeper along with steam iron to ensure each tablecloth was ironed before use. 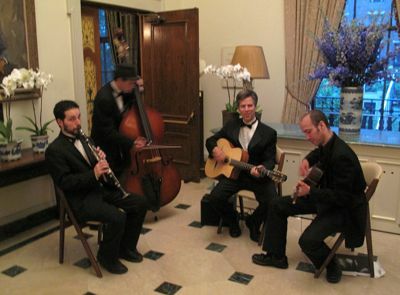 A quartet played jazzier music during the reception in the upstairs foyer, note the large arrangement of blue delphiniums and assorted pots of orchids in the background. 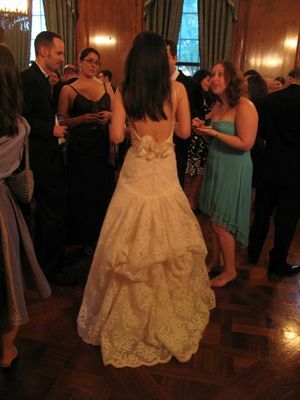 Another view of the bride’s gown. The top of the wedding cake, covered in fondant and festooned with sugar icing peonies. A shot of the wedding cake, baked by Sister, and included some icing/sugar flowers brought as luggage from Manila! 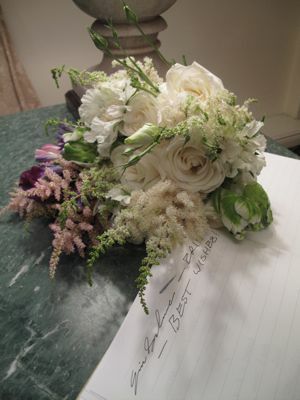 One of the bouquets made by Sister, laid beside the guestbook. A few cousins in “kodak-kodakan” moments as we waited downstairs to distribute favors as guests departed. …and were handed out to each guest in a little bag with blue papel de japon. And finally, the morning after the wedding, the top layer of the wedding cake ready to be put away for ONE YEAR, so that the newlyweds can enjoy it on their first anniversary. We ate our little fruitcake giveaway and it was utterly superb! Phew. I collapsed the next day and stayed in bed for most of the following 48 hours to recover! But as always, another family wedding to remember! Congratulations again to the bride and groom! What a beautiful wedding! The wedding gown is so elegant. And the cake is a work of art. Bravo to Sister! That photo of the bride smacking the groom is priceless — how did you manage to catch that moment? Extremely elegant! Wish the bride and groom a blissful life together for all eternity. You did more than excellent job MM. You are one of a kind. Ahh, weddings. So beautiful, so lavish, so much drink, so much food. Best of luck to the beautiful couple! Thanks for warning me at the start of this post but rather than go away, I got curious. It is always interesting to see how the other 1% live and carry on. At the risk of “swooning”, let me just say I am cutting you some slack. You make up for it with posts like Taba ng Talangka! Hey, is it eyeball time yet!?! Beautiful! Thanks for sharing photos of this lovely event, MM. exquisitely beautiful. 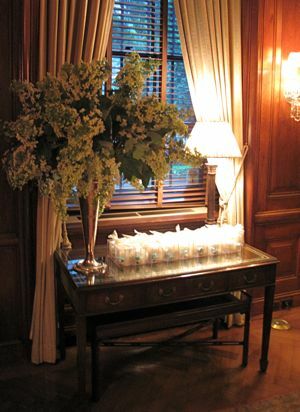 Love the flower arrangements.I love freesias. Their fragrance just reminds me of home. And the cake! Wow, Sister, that was great work. 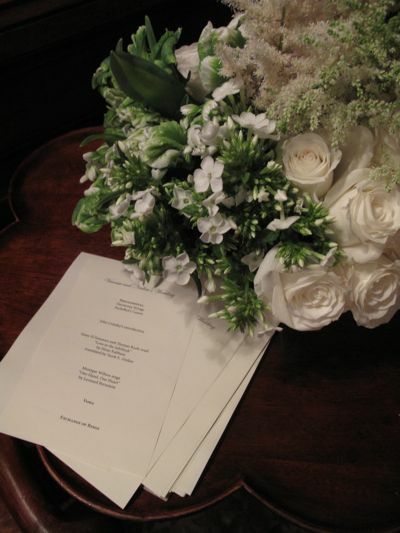 Congratulations to you and MM for the beautiful arrangements. Best wishes to the bride and groom. Y’all did a wonderful job…all labor of love!!! Best wishes to the newly wed!!! i love it! everything! beautiful! and nothing over the top at all. i’ve been to so many local weddings that are so “grand” they’d put barnum and bailey to shame. Congratulations to the groom and bride! and to the Sister for making such beautiful wedding cake and one of a kind giveaway, and everything elegant for the wedding. Every detail is splendid! I love the flowers, they are all gorgeous, and I love the simplicity and yet oozing elegance of the wedding theme. The bride’s gown is spectacular! And don’t let me start on the wedding venue, it’s simply fabulous! Yet another unforgettable MM and family event. Thanks for sharing! I forgot to salute MM’s deft hands in the flower arrangements :-) I wish I have your artistic eye in making those gorgy centerpieces. Way to go MM! Sister is marvelous! That cake was breathtaking. The bride looked so beautiful! Sister!! Cake, flowers, venue – everything looks stunning! Extremely envious of your cake making abilities! It is certainly a dream of mine to learn how to do. Thank you for sharing. Congratulations to the newly weds! The cake, the flowers, the gown are all stunning! Thanks for sharing. LOVELY!! got to see this again, since i’m at work…thanks for sharing the beautiful wedding dress, MM…excellent job on the floral decor, inspite of illness!! …and they lived happily ever after. Congratulations to the niece and mother of the bride! Splendid! thank you for sharing. Yes, Silly Lolo, like a fly on the wall,I am also interested in how the 1% live – but hold judgment on how blessings are distributed. Thanks for sharing! Everything is exquisite! The bride looked so beautiful in her Vera Wang wedding dress! And your sister put a lot of work (and her heart) into the little details that mean a lot! That was a mean looking wedding cake – very professional! Too bad you weren’t feeling well – but you did one superb job with those flowers! Post some more photos if there are! MM and Sister…..truly the Quintessential Event Planners!!! 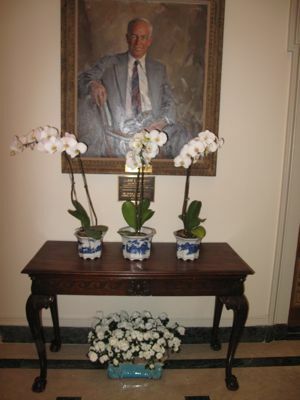 Hay, Sister….it would have been an honor to have done those gumpaste flowers for you….even the Moth Orchid in the planters! What a lovely and elegant wedding!Best wishes to the newly weds!The bride looked so beautiful in her Vera Wang wedding dress!MM, I salute your creativity as well as your energy despite your illness! Sister, you are one of a kind!–the flowers, the cake, the give aways, the linens, candles and every little detail—very elegant indeed!Brother and sister team, you put the best wedding coordinators to shame!CONGRATULATIONS! 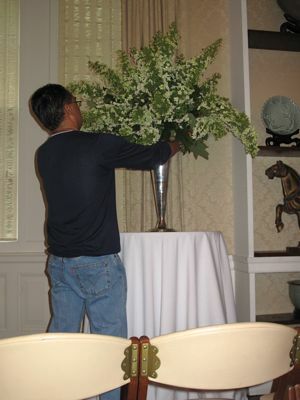 Beth, the venue had a policy that required that EVERYTHING we brought in had to be removed by the end of the event… so yes, most guests took home an orchid, azalea or arrangement. Only the largest arrangements were returned to sister’s apartment! 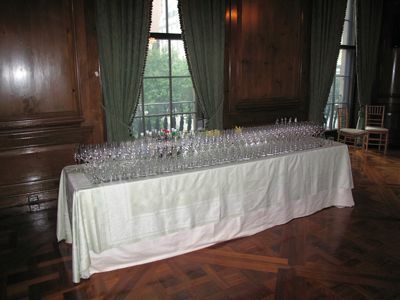 Last May 2nd, I attended a fabulous wedding whose reception was also at the Pratt House. 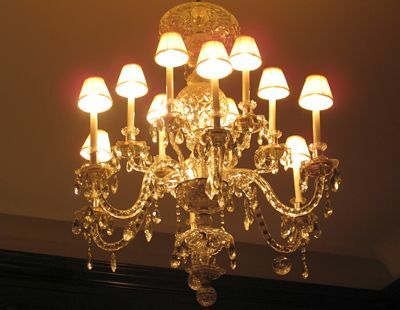 It was just as elegant. The bride and groom are both lawyers. The bride is from one of the prominent families in Manila while the groom is American. I’d be as intrigued as you, MM! Beautiful place and event! Sorry to hear you weren’t in best condition to enjoy it all! haha: Fishpan warning at the beginning of the post.. that’s good. nwei, MM and sister congrats to a superb wedding. 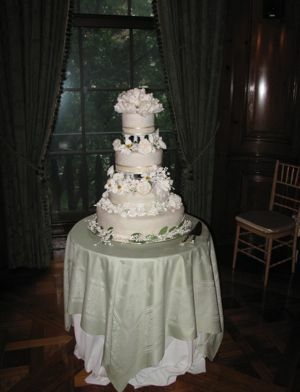 what a beautiful and elegant occasion from the flowers, cake, and especially the wedding gown. wow, i love it.. congrats to the bride and groom also.. she looks lovely by the way..
everything but simply everything spelled exquisite taste and elegance! A Life event as an exquisite work of art! My best wishes to the newly weds and hats off to those who made the wedding details happen! Best wishes to the newly wed! The wedding gown was gorgeous! The cake was beautiful! Congratulations sister for a wonderful labor of love. You remind me of myself because I remember doing the corsages for the cotillon members and all of the flower arrangements for my daughters’ 18th birthdays until the wee hours of the morning. That is mother’s love. Congratulations too to Marketman for the beautiful flower arrangements. Ooops, I meant best wishes to the newly weds! MM and sister, can you “adopt” my daughter as a relative so you both can take care of her wedding arrangements?….hehehehe. Sister, you did an awesome job!!! Truly a labor of love! Your daughter look stunning in her Vera Wang. MM, if you were under-the-weather arranging the flowers, I wonder what it would have been if you were in tip-top shape. The arrangements were simply elegant. CONGRATULATIONS to the Bride and Groom!! Beautiful wedding. I wish you’re my uncle too. You could have use a talented person like you to help me with my wedding. Great job Mr. MM and congratulation! congratulations to the groom and best wishes to the bride. so nice to see pictures of celebrations of love and family. Beautiful bride, handsome groom, doting uncle, awesome mom, exquisite cake, wonderful wedding!!! Off to a great start! Congratulations and best wishes to the newly married couple! so beautiful! the pictures are like shots taken from a bride magazine! okay, im done with my daydreaming and back to reality. weddings are really special but this one is really above the superlatives. just lovely and everything is so beautiful. above all, i wish the bride and groom happiness, good health, more wealth and may they remember the beauty of this day to remain steadfast in their love and commitment to each other. thanks Mr. MM for sharing this to us your readers, you make us feel like a family already having shared these photos and details. congrats to the Sister also for preparing painstakingly everything. i know you are such a wonderful mother! Wow, everything looked beautiful and elegant! The bride’s gown looked exquisite. Thanks for sharing, MM. The Teen must have inherited Sister’s cake-making abilities, based on Mrs. MM’s bday cake a few weeks ago. An elegant wedding, indeed. Congratulations to the bride and groom! Everything more beautiful because of the personal touches. Wish I was as slim as the bride! Ooops! The wedding I attended was cocktails, dinner and dancing. The ceremony was in a Catholic church. It was just as beautiful as her sister’s wedding a few years back. 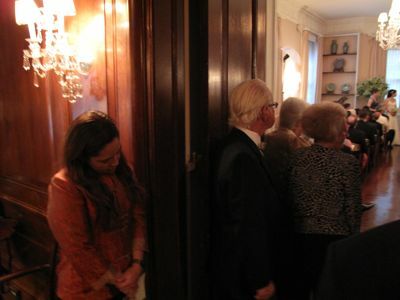 They had around 120 guests. It was a black tie affair. sanojmd, I think it’s more of a western tradition. I am not the wedding cake expert at all, but I think there was a time when the wedding cakes were white cake for the bride and darker denser cakes (usually fruitcakes) for the groom. At some point, they merged into just one cake. In some countries, it is still traditional to do a very heavy fruitcake that has the lower layers of a multi-tiered cake served at the wedding reception, while a portion, sometimes the top layer, is saved for a later date, usually the honeymoon or anniversary a year after the wedding. In colder countries, the fruitcake heavily doused in brandy would keep nicely for a year, and actually age and taste better… in tropical countries, without refrigeration, the resulting cake might be a bit frightening after a year! now i know…hehehe. this is what i love about this blog.. good food, good recipe and so informative.. now, not just a food blog but a travelogue with bed bugs and all. lol. thanks so much MM..
I’ve read a book on wedding etiquette that the top layer of the cake is traditionally preserved for the bride and the groom to enjoy on their 1st year anniversary. 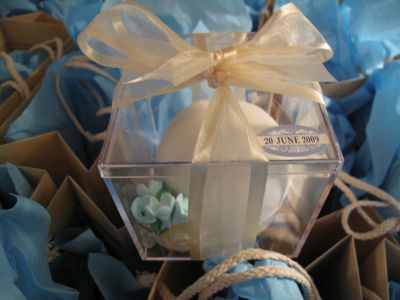 The same book also says that wedding gifts are sent to the newlyweds within one year from the time of the wedding. Both traditions are unheard of in the Phils, but why not no? The former is a charming and sentimental, and the latter, very practical. The cake and the flower arrangement looks so beautiful and professional. Is this pure talent between you and sister, Marketman? I am just curious if both you and sister went to cake and flower decorating courses sometime ago. And also it’s amazing how the bride stays so slim with sister such good cook especially baking! really beautiful ! thanks for sharing..
more power to market manila ! Such whiteness… now adjusting the brightness/contrast of my monitor.. White is a nice non-color but I cannot stay immaculate and pristine wearing white, the sauce always finds me. Lee, isn’t it weird that no matter what you do, the days you seem to eat spaghetti or pancit, you are always in a white shirt? 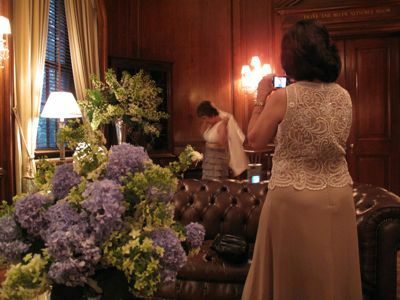 Mr. MM, did you take a pic of the bouquet? just curious. Looks like this time Sister and MM became simply a loving Mom and Uncle….Astonishingly beautiful !!! Congrats !!! Sorry MM, et al, I was really curious about the story behind the â€œfishpanâ€ lady and after reading fatcat and your response to him, I combed your archives. The add-on photo on your 25 March 2006 response was genius. I am obviously very behind…. Too beautiful for words! Congratulation to the couple! The cake made by the mother.. that’s just wonderful! Had to laugh, my mother bought her own linens too for my wedding over a decade ago, well just for the main tables- same store, same color ( a pale green)- and I was wed a few blocks north west of your venue- weddings are just that, memories to have and to hold, and to bring a smile to your face at just the thought! I hope you are still blogging when the teen weds- ( in 20 odd years maybe?) Can’t wait to see those flowers and that cake! A part of the wedding cake is kept for the first-year anniversary or the christening of the firstborn…whichever comes first? Hi, I’m new to your blog :) Someone at facebook posted a link about your macaron experience at Pierre Herme in answer to a macaron post I did myself. So far, I love your blog and will be lurking around often! And oh, consider yourself blogrolled! That wedding gown, those flower arriangements, and that cake–breathtaking. Just curious, why did you have to bring sugar flowers from Manila, MM? amazing that a non-professional baker actually made THAT cake at home! MM, you mentioned Monique Wilson…Is that the same Monique Wilson, the famous Filipino world class talents. A great singer indeed. Gina: In addition, those gumpaste flowers are being exported to North America ages ago. If I am not mistaken, those that are exported to North America either come from Philippines or Indonesia. If you are here in the Lower Mainland, I can show you how to make them…any flower you would like. It takes patience, nimble fingers and attention to detail. P.S. Absolutely love your fishpan articles! MM and bettyq, I learned something new today: sugar flowers from the Philippines are exported to North America! bettyq, thanks for the offer! I reside in Manila, just a newbie at baking, but have read enough of MM’s blog to be mightily impressed by the breadth and depth of your culinary knowhow and generosity. 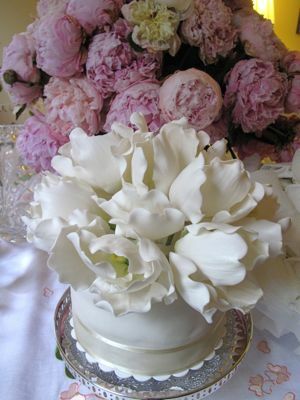 Love the flowers, cake and of course the bride’s gown! 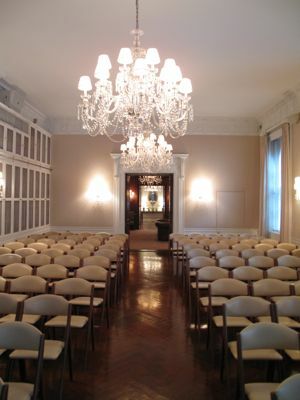 So dreamy and perfect for an intimate wedding. Congrats indeed to the bride and groom! MM,where did you buy the sugar flowers?I think there’s a stall in divisoria that sells them but I was warned before that they’re not really edible as they put some kind of glue(? )to preserve and harden the flowers.Do you think it’s true? Beth, my sister-in-law gets them from a supplier to many of the top cake specialists in Manila. These are made by professionals and not typically marketed for retail. I don’t have the name of the place, but if you are really interested, I can ask her and possibly post the information. MM, what a wonderful affair. The cake looks amazing. Salute to sister. Thank you for sharing such momentous event. Love the dress! Love the cake! Love the flowers! What a beautiful wedding! 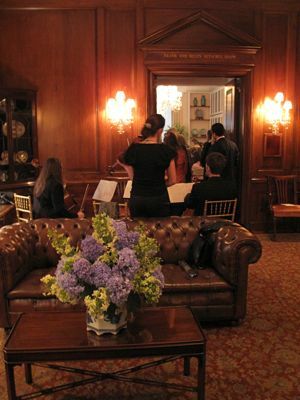 Understated in a way that makes it classy and elegant and the most important and touching ……members of the family contributing their talents to orchestrate such a memorable event……priceless! Yeah, MM, would it be possible to get the name of the supplier of the sugar flower? Are they edible or just for display? Thanks. Beautiful dress for a very pretty bride! Congratulations and best wishes! Nina: GUMPASTE FLOWERS… they are edible. However, a word of caution…in the olden days, before the age of “sealers”, they are generally placed on the cake right before the cake is placed on the cake table by the cake decorator. It cannot be placed in the REFRIGERATOR together with the cake if the cake needs refigeration. Worst enemy of gumpaste flowers then is MOISTURE. Then came sealers! And no, Beth…it is not made out of glue! The sealers we use here anyway is made specifically for SUGAR centerpieces like PULLED SUGAR! It is non-toxic and edible! Beth, I think what you are talking about are flowers made out cornstarch and glue. It looks like gumpaste after it is kneaded like dough. If that is the one you are interested in I can give you the recipe for that dough. But I do have a recipe for gumpaste as well which is really excellent…it is not found in any baking book. I learned it in my apprenticeship days and that is what I have been using all these years! OMG!What a gorgeous wedding! (everything in exclamation points here! :) The bride is absolutely stunning! I don’t understand the “fishpan” lady’s comments though. Isn’t the reason we work so hard is so we can ENJOY life? She’d probably have a fit when she sees the “non essentials” in my home hehehehehe. Anyway, the cake is just wonderful! And the flowers?Bow again to you MM. Great material, as usual, MM. Thank you for sharing! Thank you for the lovely comments and all the good wishes. Bride and groom are back from a two week trip to Alaska and have settled into a garden apt. with calamansi and gardenia bushes out back. The wedding was produced by MOB, FOB, MM and family, and various cousins pitched in for many weekends making the 200 little wedding cakes to give away. Several prepped the flowers and it was truly a family effort to get it all delivered in time in a U-haul truck driven by the father of the bride. No, he did not drive it back in his tuxedo, the doorman did that so even the staff of the building I live in were highly involved. The caterer and venue manager were immensely impressed. No other wedding they’ve ever had involved family so much. The cakes were a dark English fruitcake covered in jam, almond paste, and fondant. 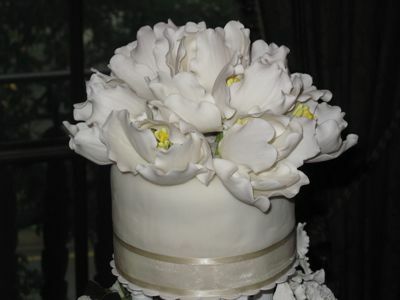 Parrot tulips on top layer of the wedding cake were from Ruth Drennan, who is often featured in wedding magazines. She so kindly agreed to make them when I explained that I was making my daughter’s wedding cake. The rest of the sugar flowers were from Petal Craft, in QC, suppliers to Goldilocks. If one needed hundreds then contact them otherwise please don’t bother them for a few only. They are in Ventura, CA as well. I can make flowers but just don’t have the time anymore. I don’t recommend eating them. If I could go back in time I should have left the rest of the cake bare with only the tulips on top but the Filipino genes kicked in. Less is more but can’t get away sometimes specially when one has not slept for 48 hrs. MM was wonderful to come inspite of being so sick. I can only say I hope I’ll be around to help with his daughter’s wedding when the time comes but that may be a decade or so down the road and I could be pushing up roses by then. Congratulations and Best Wishes to the newly wed. Sister you are an accomplished baker, florist and event planner summed up in one body! No limit (scrimping) and only the best including the detailed steam ironing the table clothes! I know it was a collective efforts and Sister you are behind in all of these efforts and works. Sister, you are a leader! Looking at the photographs alone without reading the featured article, I would think it is a Bride Magazine photo shot. This wedding will be part of your Legacy. Thanks much for sharing one of your memorable events in life with us. Greatly appreciate it. Sister, did you use the same fruitcake recipe you shared with us in one of MMâ€™s archived posts? My inquiry mind wants to know if any tweaking to your published recipe done on this wedding cake? BettyQ: greatly appreciate it again if you can share here your sugar flower gumpaste recipe. Thanks to you MM, Sister and BettyQ for all your generosities! Maria Clara- yes, I just used the fruitcake recipe featured on a Marketmanila post. I made 18 batches 2 months before the wedding and the cakes occupied the refrigerators of three kindly neighbors while they were away. I basted them with brandy every two weeks using up an entire case. MM sent the moscovado brown sugar which gave it a wonderful caramel flavour. Almond paste and fondant was ordered from Albert Ulster. Fruitcake is the most traditional wedding cake and I used it because it could be made way in advance. Thank you MM and sister!So it’s Petal Craft in QC.Do you have their contact numbers?I’ll note it down for future use. Ahhh, I see. Well, I’m sorry to hear that. I’ve never understood why people insist on ordering bloggers what to write and how to write it. Like you say, if you don’t like it…” It’s your blog and you should write about whatever the heck you want! I say don’t even give them the benefit of a warning – those readers should just deal with it! a dream wedding for any girl. congratulations and best wishes to the bride and groom. hats off too to mm and sister. i wish i have your artistic talents. Everything looks so lovely MM! Well done to all the people who have made this possible. Congratulations and Best Wishes to the newlyweds! I can really appreciate the efforts you put into all the elements. I’m a part-time wedding planner and I know how tedious and draining it can get, the day can get pretty crazy! Cheers to the newlyweds! quick hello am in north west sicily at the eolian isles. MM, I noticed that sister’s daughter is very svelte and the Teen also seems to have the same bone structure. If it’s a family trait, the eat-anything-and-not-gain-an-ounce gene, then I’m completely jealous! Hi. May I ask for the contact information or website of Petal Craft supplier in the Philippines? I am trying to find a supplier of gumpaste flowers and saw that you bought the lovely wedding cake edible flowers from Petal Craft. I tried surfing the web for this suppier but directs me to a UK Flower supplier. Thanks. i don’t know which flower am i going to pick for my wedding this october 2010. my wedding motif is yellow and plum.. which flower do u think will be nice for an october wedding that costs less? thank you..